I had a 90 MB file that I needed to extract on their system (224 MB uncompressed), so I copied the file to their system,right clicked and chose extract. Then came the wow factor. 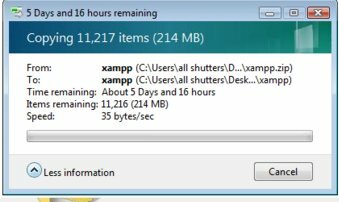 Vista told me that it out need ~13 hours to extract the file. Waited for a few mins and it didn’t go down. It really was going to take it 13 hours + change to extract it. Certainly made me go wow. I didn’t take a screen shot of it at the time, but then as I was telling my cousin about it, I decided to blog it so needed to take a screen shot. When I took the following screen shot it was telling me that it would take 5 days to extract. I waited for a couple of mins in case it was just exaggerating like Windows XP and it would show the correct time in a few mins. But alas it kept showing me the same time. BTW, just as a comparison, my Windows XP system on a 1 GZ system with 512 MB of RAM takes ~2 mins to extract this file. Haven’t timed it on Linux yet. And this vista install is a running on a new machine thats pretty powerful. And i am not the only one who saw this. Another guy was complaining about it on one of the forums that I visited. His file was taking ~15 mins to extract on vista while on Linux it took about 11 secs to extract. Ah well. I think I can do without the wow in my life. Pretty happy with Debian and XP for my systems. Don’t think I will be upgrading to Vista anytime soon. I ended up unzipping the files on xp. Vista also, gave me the same kind of trouble with formatting and burning a cd. AND, you know my issues with Vista’s UAC. Yup. i didn’t talk about the UAC because I didn’t want the post to come out as a stereotypical anti-MS/anti Vista rant. Well, that being said, I see no point in upgrading to Vista.